Israeli soldiers demolished, Thursday, an under-construction Palestinian home in Beit Dajan village, east of Nablus, in the northern part of the occupied West Bank. 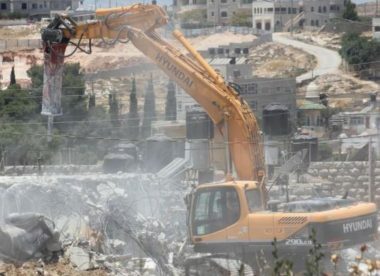 Nasr Abu Jaish, a member of the Political Bureau of the leftist Palestinian People’s Party (PPP), has reported that three Israeli army vehicles, and one bulldozer, invaded the town, after the soldiers surrounded it, and demolished the property. He added that the demolished home, 100 square/meters, is owned by Riyad Hussein Raja, and that the soldiers demolished it under the pretext of being demolished without a permit. It is worth mentioning that Beit Dajan is in “Area C” of the occupied West Bank, under full Israeli military and civil control. Area C is more than 60 percent of the occupied West Bank and falls under the direct control of the “Civil Administration Office,” run by the Israeli military.